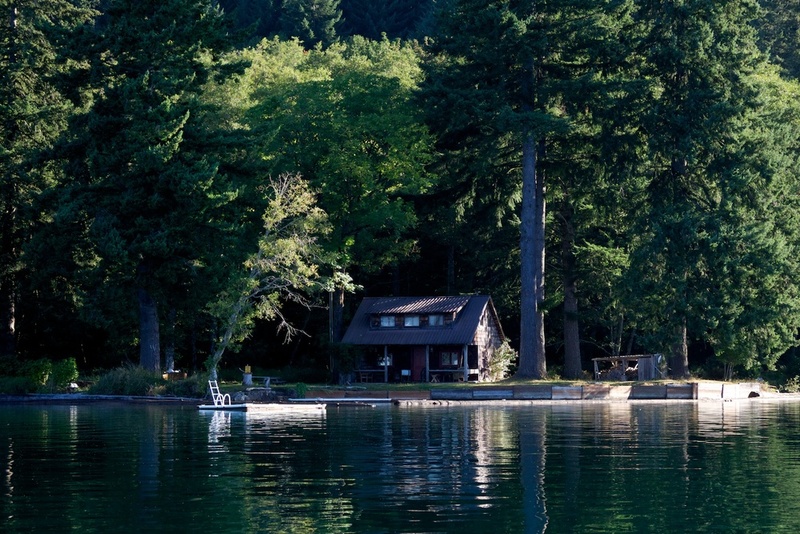 A few weeks back I was sailing along the shoreline of Lake Merwin when I spotted a little rustic cabin nestled into the woods. Thinking it might just make a nice shot, I nosed the sailboat into the small inlet facing the cabin, doing a quick loop looking for an interesting angle. The sun was already higher and brighter than I would prefer, in fact I would be shooting toward the sun, and the shade was extremely dark and blue from reflected sky. I was also single handed in my boat, didn't want to get too close and invade these folk's pristine space, and the dogs were running around deck thinking we might be heading to shore - not exactly the formula for a good picture. But I decided to give it a go anyway, grabbed the camera, spun a few dials, and snapped a few shots as the boat came around the cabin, keeping the boat in line with one leg over the tiller. The result? Out of camera, nothing to write home about. I think I uttered "meh" under my breath, put the camera away, pushed the tiller over and headed back out to open water. Out of camera, this shot just wasn't anything that interesting. But, that's not the end of the story. Enter RAW vs. JPG. Just as many photogs have acclaimed, I find the out-of-camera JPGs from the Fuji X-E1 are amazing. In fact, even though I always shoot JPG + RAW, I go to the JPG file 90% of the time. My most common post-processing tonal adjustments work great with the Fuji's JPG file renderings. This is opposite to my experience with the Nikon system where my JPGs seemed unforgiving to most any tonal adjustments and I always started from the RAW file to get the look I was going for. But... even with the Fuji X system, there are still those times when the RAW comes in handy. Especially when I really need to push, ahem, salvage, things. So, back to the lakeside cabin... When I took the picture I set an exposure that would retain detail in the sunlit boards along the lake shore, but this left the cabin underexposed by a few stops with details hidden deep in shadow. A purposeful tradeoff. With the out-of-camera JPG, attempting to recover this much detail from the shadow areas becomes comical. JPG compression works by taking away information in areas that we won't notice, one example is the smudging of color and detail in shadow areas that we normally wouldn't be able to work out. Out-of-camera JPG with final crop, color balance, and strong shadow-boosting curves adjustments. Your JPG is showing! RAW isn't nearly as compressed, and since each channel is compressed independently color doesn't smear and shift. The difference in this case is quite noticeable. RAW file with final crop, color balance, strong shadow-boosting curves adjustments, touchup and noise reduction. Not bad for having taken this with one leg swung over the tiller, fighting off two shore-happy beagles! So, why not just go for the RAW file all the time? It does take a bit more work and a lot more processing power. But mostly I like the X-E1's built in raw-to-jpg converter better than Aperture's RAW converter. As others have said before me, the Fuji X out-of-camera JPGS are simply beautiful, so I prefer to use them whenever I can. If you found this interesting you might want to check out the related post "Fuji X Raw Files."